To view all of the photos from Taiwan, visit my Flickr Photo Set here! You may click any photo on this page for an expanded, larger view. Spending the better part of three weeks in Taiwan was beyond words. I felt like my heart cracked open and stayed open. I knew the people would be very sweet and kind from my experiences of working with many people from Asia through my connection with the Lapis Lazuli Foundation. I also knew but did not viscerally know, that making the trip would change my life, and for the better. I flew from Honolulu to Seoul, Korea, and then directly to Taipei. The time difference between Hawaii and Taiwan is 18 hours, instead of 24 if I lived on the East Coast of the Mainland. When I arrived in Seoul it was already the next day. I could already feel a difference in the air, as the feature film was in Korean, and we were served noodle cups for our snack. When I landed in Taipei, Taiwan, I had to go through customs. Here in Hawaii, I had found myself a wonderful teacher who taught me Mandarin over the course of a few weeks so I would at least have a few basics. Her name is Qiaoer (pronounced Chow-Are). 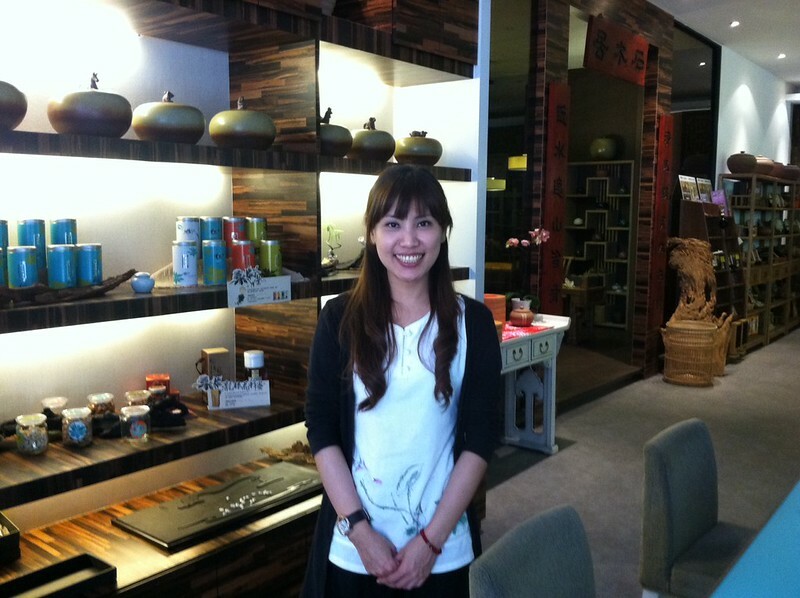 She is a masters student at the University of Hawaii at Manoa, and a very accomplished opera singer in Mainland China. She is obtaining her masters so she can reach the top level of performance in China. She is becoming more like family than my Mandarin teacher. I believe she will become a superstar in China. Her voice is exquisite. Back to the airport. I cried when I saw Li-huey (pronounced Lee Way), my host, and Hui Ching (pronounced Way Ching), the translator, waiting for me at the airport. It just was so surreal, and also very familiar. Many, many things had to fall into place to make this trip possible, and they all did. We drove the hour back to the apartment. The classroom where I would be working was directly underneath the apartment where Hui Ching and I would be staying. What a beautiful apartment! It was in the Ming Dynasty style, with rosewood furniture, carved with Buddhist symbols. The showcase of the living area was an altar with a large portrait of the Dalai Lama and a bronze statue of Kwan Yin. 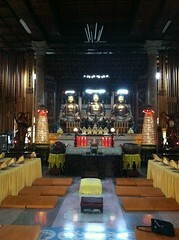 Kwan Yin is the principal deity of this region of Taiwan. She is palpable here. Every altar space has Kwan Yin represented. I slept in that first day, just to catch up with the time difference, and began work in the afternoon. Li-huey was amazing. She not only organized all of the classes and private sessions, but would then shop and serve the most delicious food for lunch, all vegetarian, and all organic. As you can see from the photos, I was amazed by the food. I have never been a foodie, but I could not believe how scrumptious the food was in Taiwan. I know I was spoiled with a home-cooked meal every day, but in general people put much love and attention into the food. I grew to love pineapple cake, different kinds of tofu, funghi, plum powder, plum vinegar, their special cooked eggs, and other delights. The only reason I did not gain a pound was because I did not eat after sunset. 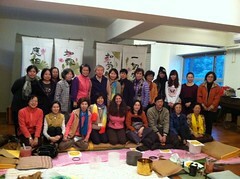 Each day I either gave two workshops, or I did a series of private sessions. The volunteers kept the ship going. (thank you Fay, Wen Chu and others!) 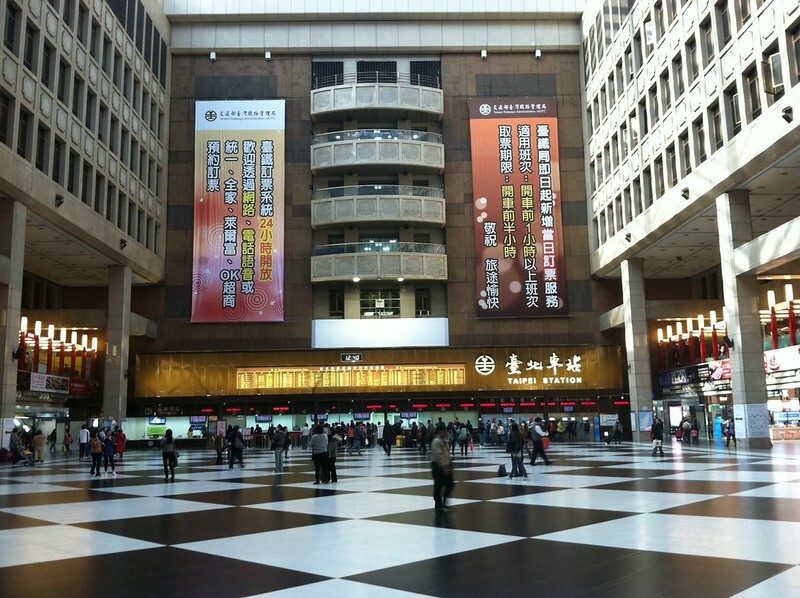 The only day I did not do sound was the day we took the high speed train to Kaohsiung. But before I share Gaushung, I would like to share a few precious moments in Taipei. Taipei had much to teach me. While I was in this international city, I had hoped to see a few sites, and also to bring back a couple of treasures. My one wish was to see the National Palace Museum. Li-huey was kind enough to arrange a few hours off where we could go. The museum has over 690,000 articles of art, china and other artifacts, from the Neolithic period to the Qing Dynasty. One of my favorite sections was looking at the ancient art scrolls. The artwork was otherworldly, so fine and intricate. There were also some amazing buddhas, some 12 feet high, made of bronze and stone. We were fortunate enough to catch a dance troupe as well. Li-huey encouraged me to dance with them up on stage, so about ten of us went to the front and huffed and puffed around in a circle. It was so much fun! 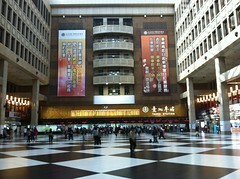 Another day the three of us took a taxi and then the subway and visited the Longshan Temple. This is probably one of the most famous temples in this international city. It was built in 1738 by settlers from Fujian, China. It was built for Buddhists and Taoists, but also includes Folk Deities. The workmanship was unreal, including ancient stone carvings (see photos). We went in the evening when people were there making offerings and lighting candles. It was such a treat to my soul to be there. Afterwards, we got in a taxi, and headed for a district where we could find a Jade Emperor. I owe a big thank you for Li-huey for not only bringing me to this district, but doing the traditional bartering in Mandarin. We went from shop to shop, and after looking at least a half dozen Jade Emperors, I found the one that was not only the best deal, but the most beautiful. He is carved out of sandlewood. He could have been made in Taiwan or China. He was also “jeweled” which means he was painted a touch on his eyebrows and lips, as well as adorned with pearls as is the tradition. Li-huey put down a deposit on my behalf. That night while dreaming, I had second thoughts about spending the money. I shared this with Hui Ching, the translator, and asked her to see if I could possibly get my money back. Calmly, later in the day, Li-huey responded. She reminded me that when you invite a deity in, it is good to keep the door open. Five minutes later I agreed, and said yes, I had a moment of fear and doubt, and after hearing Li-huey words, knew the purchase was right. 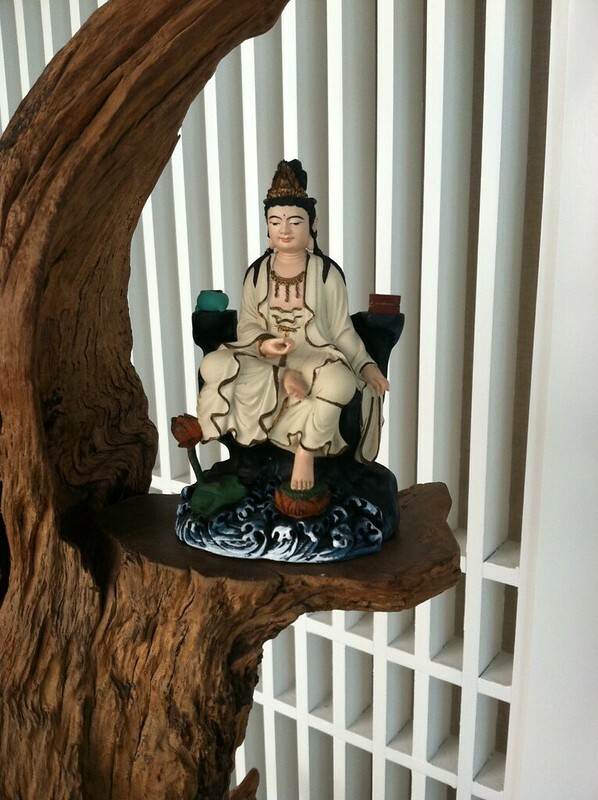 Finding a Jade Emperor in the United States is not only difficult, but expensive. This was a wonderful opportunity to have him represented on my altar. I was grateful for this important reminder. Immediately after accepting the Jade Emperor, I was given five boxes of pineapple cake, a beautiful jade Kwan Yin, not to mention my salary increased greatly, as well as all of the albums I had brought with me to Taiwan sold. 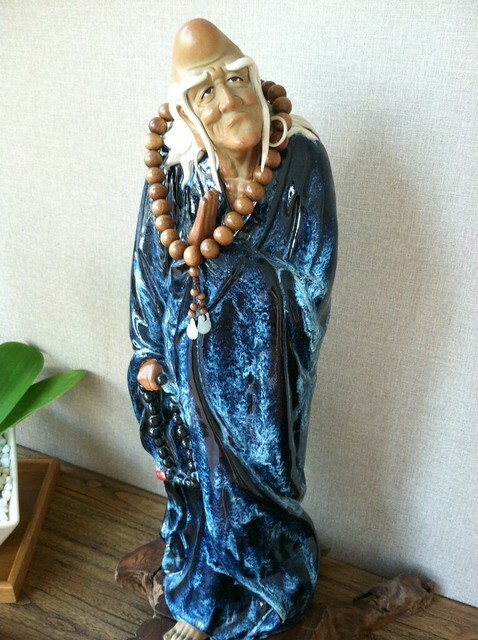 In the Taoist tradition, the Jade Emperor helps mortals, including helping them with prosperity. I now make daily offerings to the Jade Emperor at my altar. I offer him moon cakes and flower leis here in Honolulu. Though it was magical to be out in Taipei, strolling the streets and just watching lights, people, mopeds and the orderly, peaceful motion of a predominantly Buddhist/Taoist country, the real gift was working with around 600 people from Taiwan, Japan and Hong Kong. It was a walking meditation being there. 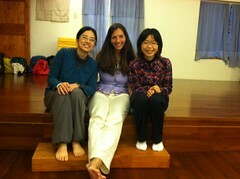 When I was not working, I was meditating, having lunch, taking a nap, and then going back to the afternoon session. Each group had its own personality, its own essence. I facilitated mostly sound healing circles. There were usually 20 to 25 people per group. All walks of life came to these gatherings. The Lapis Lazuli Foundation puts out a quarterly magazine. They published an article on my visit, so people from Hong Kong, Japan and Taiwan came for the sound. Many people had never seen the alchemy bowls made with gemstones before. I brought about 14 bowls with me in two carrying cases. Because I was in the Orient, I mostly brought tones from the Pentatonic scale. I remembered that when I gave a concert to this group in Crestone, Colorado that it was the sharps that resonated the most. The mineral bowls I brought were 24K gold, moldavite, kunzite, rhodochrosite androgynous indium apolphylite, phanacite, vanadium and opague quartz and others. I also brought two Tibetan bowls, one more for sound, the other more for vibration. I would open with an introduction to how the sound works, followed by a short demonstration, and then would play one of the lower note bowls in a circle, playing for each participant as I walked and sang to each of the sangha members of the group so they could not only hear the sound, but feel the vibration of the bowl. Then each person would get an opportunity to be in the center of the circle where I would place bowls on them, at least two. Then everyone else would get an opportunity to be part of that person’s song. The other people were given faery bells, tuning forks, bowls, rattles and other instruments that would compliment the music from the main bowls. Each song was very different, and very beautiful. All bowls were set up for specific musical intervals. The more we played as a group, the more the group came together musically, and played off each other. By the end of the two hours, we were making beautiful music together. We also sang as we did this. Sometimes we would sing mantras. We would often sing “Om Mani Padme Hung” on behalf of Kwan Yin. Sometimes we would sing specific vowel sounds that corresponded with different organs of the body. Sound is a beautiful way to “multi-task” as the person receiving has an experience of sound, vibration, the mineral kingdom, and well as brainwave entrainment. There is also the great mystery where music is a door, a portal to what is called the Shamanic World, the Imaginative World. This is where the left brain really will not understand the experience, even though it is profound and very real. The other beauty of working in groups or giving meditation concerts with the bowls, is this is an avenue of community healing. As a culture and society worldwide, it is an incredible gift to be in a supportive, safe group where we can give and receive. It is within this safety and support where we can let go of what no longer serves, and allow a door for something to come of a much higher cohesive quality. Fear is a commodity, and many people are used to wearing it like clothing. When we let go of the fear, our body, hearts and minds get a little lighter. I watched person after person come away from the experience not just lighter, but feeling more like themselves. 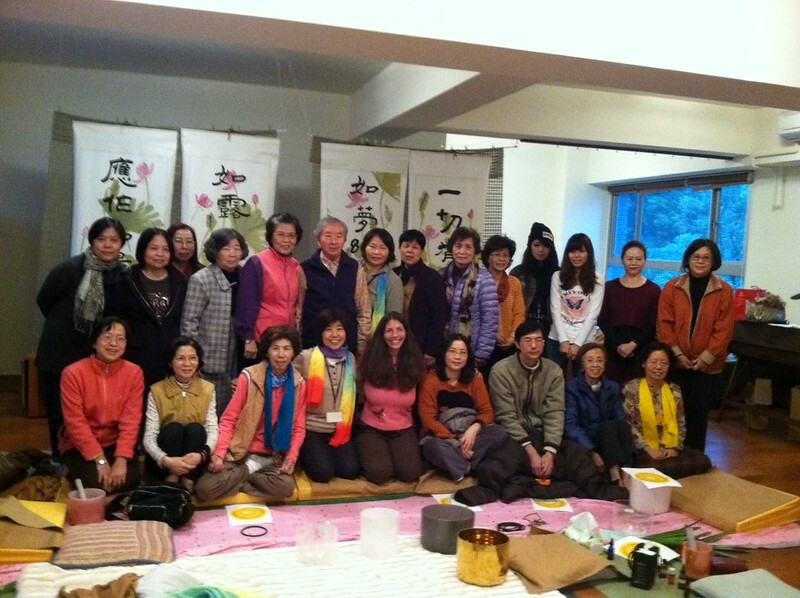 So day after day, I observed how the group would go from being a group of people who did not really know each other, to a sangha/community that felt not just connected to themselves, but connected to each other. I believe community healing is the medicine of the future. In Taipei, the routine was seamless. 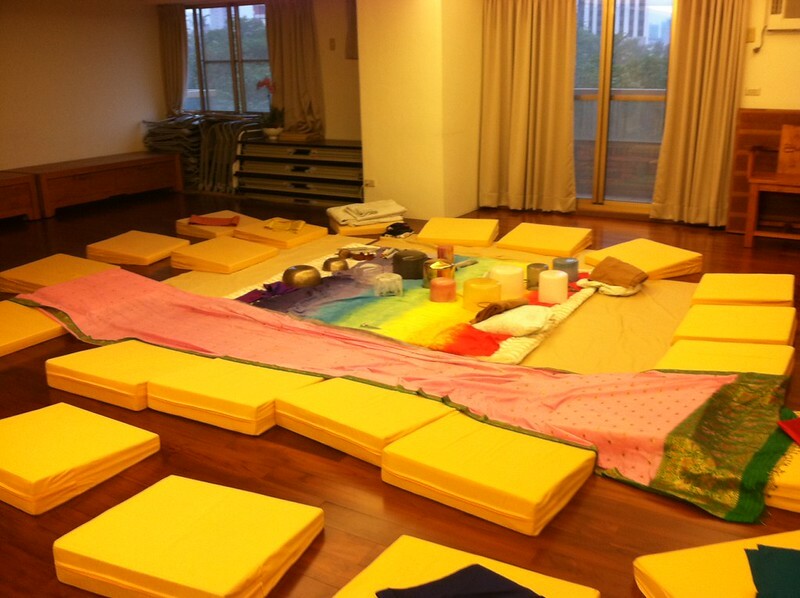 I would get up, meditate, eat breakfast, and head down to the classroom for the first workshop. We would take a two-hour break, have a scrumptious lunch that Li-huey would prepare (the biggest gift besides the people was the food, and that was mainly Li-huey’s homemade organic cooking!) then either a nap or a walk depending on my energy level. We would then go down to the classroom for the afternoon session. In the evening, I would often do my practice, and then go to sleep. I fasted from sunset to sunrise to make it easier on my body to do the work. The days we did not have classes, I did private sessions, which allowed me to connect individually on a deeper level, since we had more time. The last few days of the trip were in Kaohsiung, the second largest city in Taiwan. 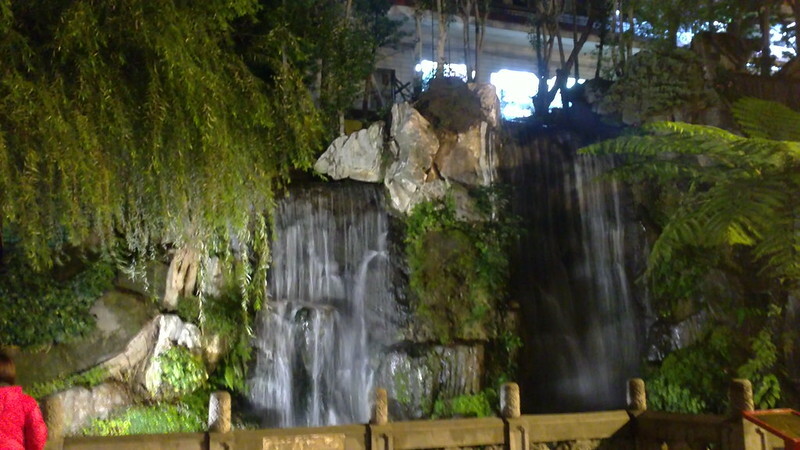 Taiwan is mostly mountainous, so the few areas that are habitable for people are highly dense with people. 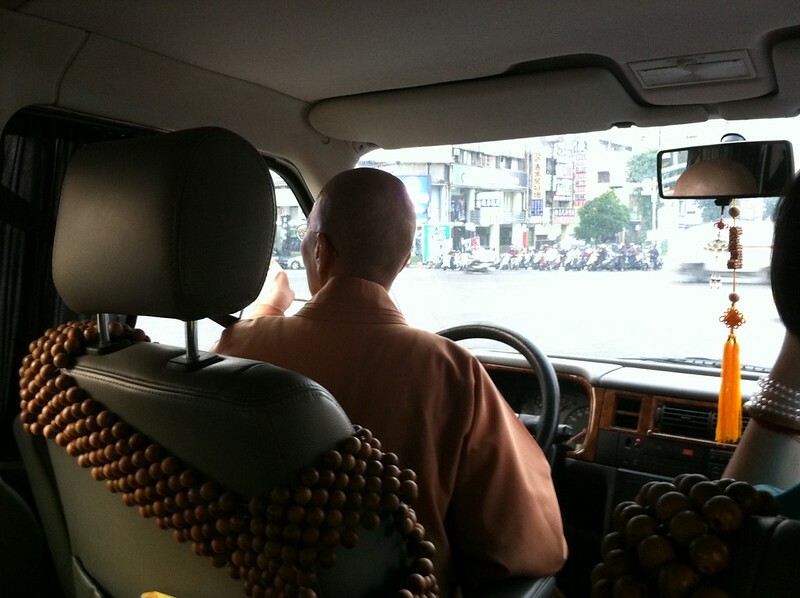 Even though there were thousands of mopeds on the streets, and cars, taxis and trucks, there was a palpable peace while driving. People did not beep their horns. They did not rush in front of other cars. They were mindful of other drivers and pedestrians. It was crowded, but somehow still easy to navigate. There in Kaohsiung, we visited the local 200-year old Taiwanese Buddhist temple. Li-huey introduced us to some of her friends that lived at the temple. We walked inside and admired the beautiful art, musical instruments, and deities, such as Amitahba Buddha, The Medicine Buddha, and Gautama. There was also a pair of golden dragons at the entrance of the temple. The temple was next to the Love River. A hundred feet from the entrance lived a pack of homeless dogs, waiting for the monks to bring them lunch. I found out very quickly how much they enjoyed Oscar Meyer hot dogs. I had the honor of staying at a very nice hotel minutes from the classroom. It forced me to speak more Mandarin and be out more in the world, navigating taxis and such. Volunteers such as Wen –Zhu and her sister, Angel. In a way, it is easier to connect with someone when you speak different languages because it nudges one to be more present with eye contact, smiles and in general listening to the song of the body, such as movement. I grew to look forward to lunch time where we could all let down a little, enjoy delicious food and laugh together. Then we would get back to the sound. 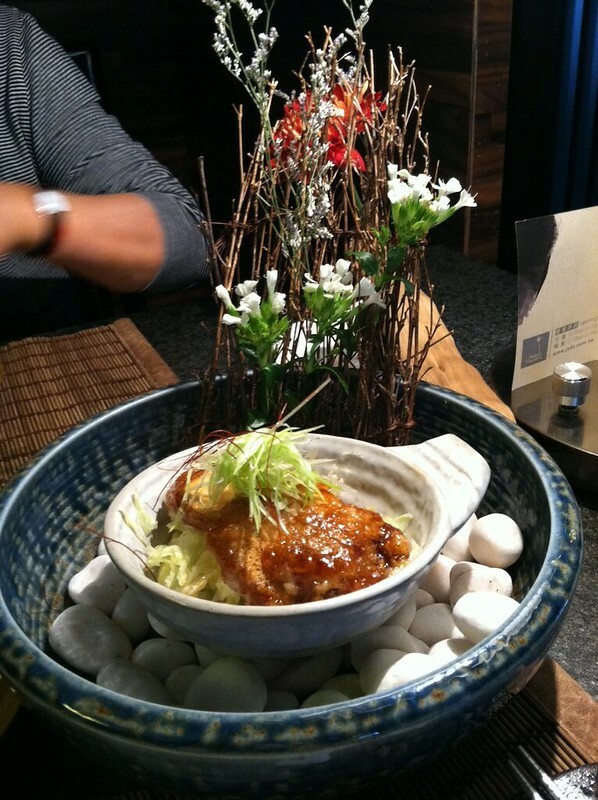 The last day of work, Li-huey made a reservation for an elegant Japanese vegetarian restaurant. I had no idea she had planned a special farewell luncheon. 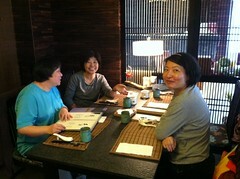 We were served exotic, organic vegetarian Japanese cuisine. 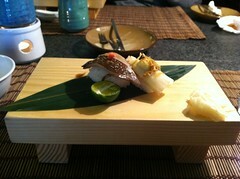 It is highly unusual to find such a restaurant. This one was called Simple Happiness. By the last day, I was feeling the emotion of how difficult it would be to leave. My eyes are watering now as I remembering feeling the pang of deep sadness in my belly that I would be hopping on a plane to Seoul the next day, and then to Honolulu. 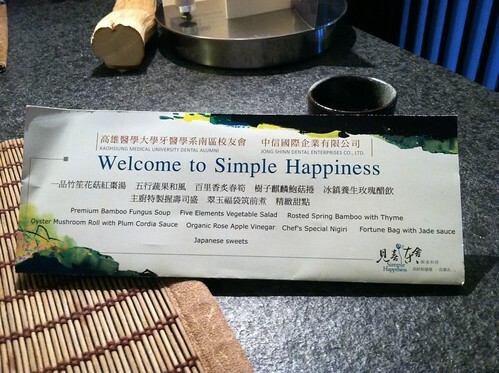 We took a taxi to Simple Happiness. Two small Buddha statues greeted us at the door, as well as a thanka of Kwan Yin. 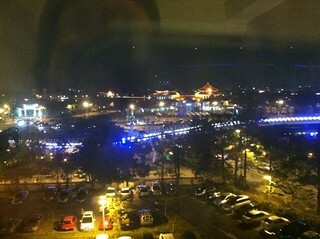 As I said, she is very palpable there in Taiwan, as she is the deity that cares for that region of the world. She is everywhere. Then more plates of rice, funghi, vegetables, sesame and other things I had never seen or heard of would appear. They would disappear, and so would the plate after we ate everything on it. And yet I was not really full. I think the servings were smaller because the food had so much energy to it. As you can see from the photos, I was fascinated with the food. In Taiwan, it is prepared with so much love. Even the more fast food places still have quality. After the meal, we took a little time to go to the tea house, also from Simple Happiness. It was just two stores down on the same block. The owner greeted us, and invited us to tea. Now remember, at this time, I am feeling pretty emotional, knowing I am leaving tomorrow. I still have one more private sound session, so I am also mindful of the time. At this point I told the translator to not worry about translating for me. For one thing, after two weeks, it was getting easier and easier to have a good idea of what was being said at least some of the time. For important things, I did lean on her to make sure there was no misunderstanding. But at the teahouse I was feeling too much to pay attention to the words. I wandered to the back of the store, and found a large Kwan Yin altar, and sat with her, chanting. I could hear it getting more quiet in the front as they listened to the sounds I was making, but I did not stop. At that point, I literally felt a physical pain so great in my heart that I could not move. I felt like the Grinch. My heart was cracking open to a bigger place. I could not speak, move, or do anything except feel what was going on in my body, particularly my heart and throat. This is the gift the people of Taiwan gave me. My heart opened deeply. A chasm opened. I looked down, and all I could see was the darkness of a canyon, followed by the lightness of having let go of whatever inside of me did not know how to be happy. 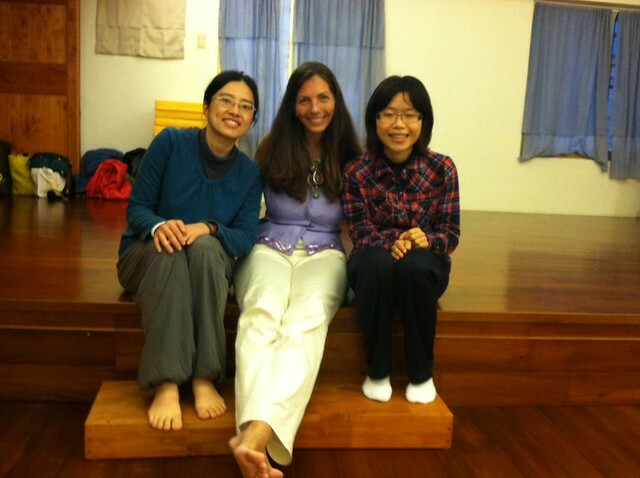 I said goodbye to her, and shortly the next day, goodbye to Taiwan…..for now. I heard the clanking of ceramic-glazed tea cups, and walked to the front of the store. There was a lovely woman still serving tea to our group of ladies. But it was time to go. We headed back via taxi. I held the space for my last sound session. I packed up the bowls, and we headed towards the train station. We had been in this fair city for several days, and now it was time to go back to Taipei. We went from train to subway to taxi to get back to the apartment. 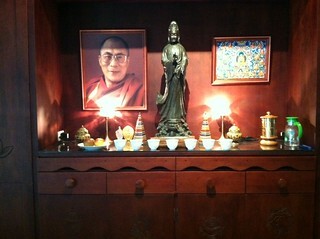 When we arrived, I walked up to the altar in the living room, and looked at the large photo of the Dalai Lama. His eyes looked so happy. I checked mine to see if I was smiling inside. I was. Most evenings, when I would retire to bed, I would look outside the high rise and see a red light on, perhaps two stories higher than my floor, which was the 9th. 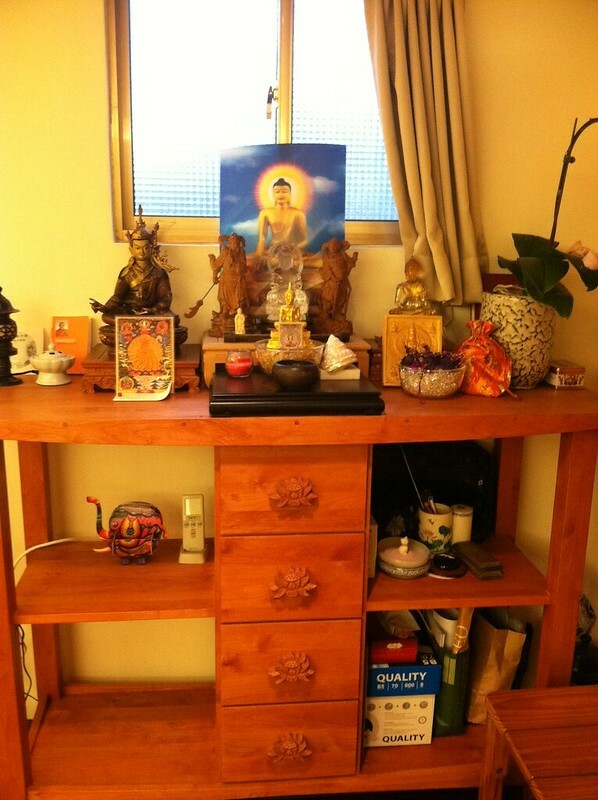 There was an altar there, with three lit white candles, and another statue of Kwan Yin. I had never seen anyone in the apartment, but this evening, there was a woman kneeling at the wooden altar. She then stood, and walked to each candle, bending her knees and bowing, delivering a mantra towards the candle. It was so auspicious to finally see this woman who had created such a magnificent altar to Kwan Yin. I thanked her with my silent voice for what she had given me each night. In the night there were two lights coming from the complex, one from this woman’s altar, and the other from Li-huey’s altar, like a lighthouse in the house of dreams. I looked around the room. There were boxes of pineapple cake, plum vinegar and plum powder, seaweed snacks, two exquisite stone stamps from Hui Ching to formally stamp letters, as well as the formidable Jade Emperor. Li-huey had also given me a deity made of amber, perhaps one of the Pure Ones, as well as a beautiful hand-carved wooden fruit, an important symbol in the Buddhist tradition. I began to pack my treasures, including a fantastic book and DVD from Dr. Mitchell May. It felt like Christmas, and it was. I was bringing back more than gifts. I was bringing back a wider heart, and feeling more as a result. The next day, Li-huey and Hui Ching escorted me to the airport. We did not take the train. They hired a driver. I watched the scenery sitting in the back seat, the traditional buildings, the temples nestled in the mountains, the hustle and bustle of cars, trucks and pedestrians, and I watched the cloud people drift by. It was very surreal. They walked me to the area where I would go through security, and after a few times of turning around and waving, they disappeared behind a wall as I walked through security. There I was, on my way again to Seoul, but this time with an immense feeling of gratitude, and a longing to go home, as I was somehow taking Taiwan with me. You will see from the photos on Flickr that I flew home on Ewa Airlines, home of Hello Kitty. The artwork and decorations brought a smile to my face. So did the carved pink chocolate Hello Kitty face on the vanilla tarte! I watched a Korean film, fell asleep, and changed planes in Seoul. There was still snow on the ground. I waited a few hours for my connecting flight. Interestingly, there was an arrest on the plane to Honolulu before take-off. Security was much tighter in Korea, and also, there was a major outburst each time I was in that airport. 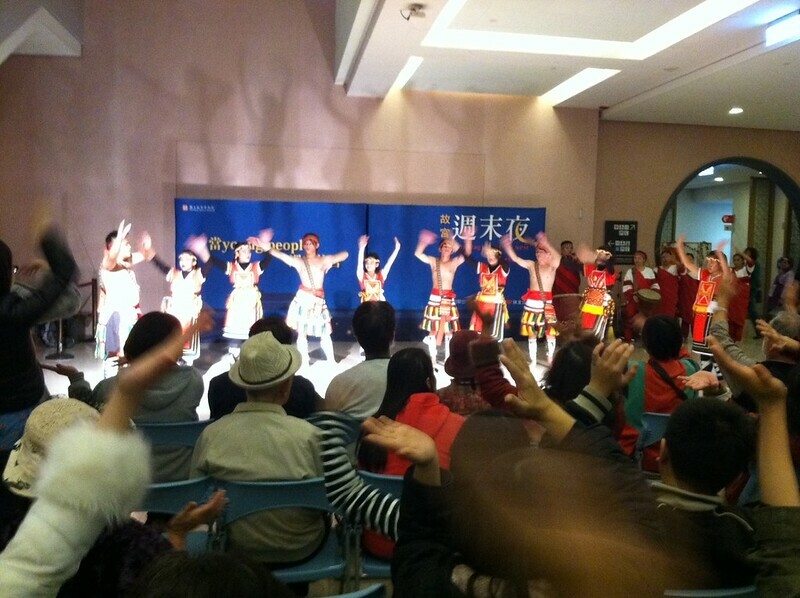 Energetically it felt very different from Taiwan. I literally sat on the plane and recited the Miracle Prayer the entire time the police were on the plane. I found when I said the prayer, the person they eventually arrested stayed calm, and when I did not, he would go through another outburst, so I just kept on chanting. We took off. I saw one of the most beautiful sunsets I have ever seen in my life on that flight. Those photos are also included. It was as if the Sun was talking with me. I fell asleep, deeply and long. When I awoke, the sun was rising. I was almost home. Home to Honolulu. Taiwan was a blessing, a blessing beyond words. The Orient is so different, so alive, and chock full of a flavor I had not known before. Now that I am back in Honolulu, I almost have to go to Chinatown here a couple times a month to make sure I have that “flavor” stay with me. Moon cakes, sun cakes and dragon fruit as well as passion fruit are becoming the norm. Li-huey and I have talked of my return, with teaching being part of the curriculum. I have been invited to Hong Kong and Japan as well, so we shall see how this all plays out. In the meantime, I thank Li-huey for being the catalyst for this opportunity. And I thank the Creator for making it happen.